President Mahinda Rajapaksa yesterday presented a historic people-friendly development oriented Budget 2015 unveiling proposals that brought relief to all folk, the highlight of which was a wage increase ranging from Rs. 3,500 to Rs. 15,000 making the lowest rank employee of the public service receive a minimum monthly income of Rs. 30,000. The minimum basic salary of a public servant will be raised to Rs.15,000. 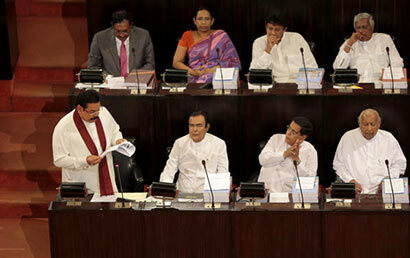 President Rajapaksa yesterday presented his 10th consecutive budget in his capacity as the Finance and Planning Minister. Presenting the budget, he said that this budget within the period 2015-2017 will lay the foundation to enable our people to reach a per capita income of US dollars 7,500 by 2020. The maximum PAYE Tax rate has been fixed at 16 percent to ease the burden of wage earning employees and professionals and to reduce the Value Added Tax to 11 percent. The President also proposed to place pensioners’ emoluments based not on the 2006 salary as was requested, but on the proposed 2015 salary structure to permanently correct the inherent anomalies affecting pensioners when salaries of public servants are revised. All pension payments will be adjusted in accordance with the 2015 new salary structure. The government will reduce the domestic water bills by 10 percent. The budget also proposed to introduce a pension scheme for apparel sector employees and Sri Lankans employed abroad and a pension scheme and an insurance scheme for three wheeler drivers. The budget also proposed to extend the insurance scheme introduced in 2013 to compensate loss to human life and property and to cover crop damage from elephants as well, from 2015. The President proposed to increase the Mahapola Scholarship for undergraduates from Rs. 2,500 to Rs. 4,000 by January next year. It is also proposed to increase the Samurdhi allowance to Rs. 3,000 for a four member family and Rs. 2,000 for a three member family. Parents whose children are serving in the military and Police are to be paid Rs. 1,000 monthly with effect from January. Proposals were also made to increase the minimum salary of a private sector employee to Rs. 10,000 by 2015 and a Rs. 500 allowance to be added each month and the EPF payment of the employer to be increased upto 14%. The President also proposed to recruit 50,000 teacher assistants to rural schools next year, while another 50,000 youth will be recruited as trainees next year to fill the vacancies in particular in the provincial and rural centric services as a large number of retirements are being experienced. It was also proposed to grant a non-resident living allowance to any Police officer who is attached to a Police Station outside his residential districts if the Police station has no sufficient residential facilities. Police Constables and Sergeants will be given motorcycles at a concessional price of Rs. 50,000. Teachers and postmen too would be given motorcycles at a concessional price of Rs 50,000. He also proposed to increase foreign training facilities for Tri services and implement a new salary and allowance structure from January next year. The Budget also proposed to offer a 12 percent annual interest rate for deposits of pensioners and elders. It was proposed to increase the price of paddy to Rs. 40 from Rs. 34 while providing seed paddy free of charge to the farmers. The fertilizer subsidy of Rs. 350 will continue while a Rs. 3,000 allowance will be granted to the people suffering from kidney disease in certain districts. The President also requested the TNA to join hands with government programs to serve all the people of this country alike.